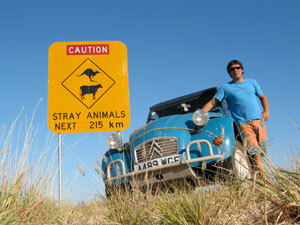 In 2004 I agreed to let the 2CV mechanic Louis Barbour build me one of his 4x4 converted 2CV's to take to Australia for a solo adventure. I wanted a break from working in the entertainment industry and after 16000 miles I returned to the UK and unfortunately (or fortunately) the desire for more 2CV adventure took hold. I also filmed my trip in Australia and as a result have enjoyed learning new editing skills and web design. As a result I have brought together these new skills here. 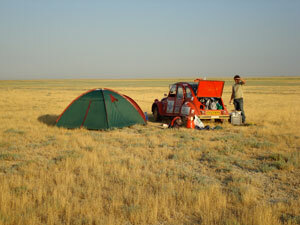 I hope you enjoy looking around..
London to Mongolia for the Mongol Rally 2007. The vehicle was a 1988 2CV6 Special. Paris - Persepolis - Paris 2011. A 40th anniversary attempt of the original famous raid in 1971. Completed by doing exactly the same route in the same time. The vehicle was a 1982 2CV6 Special. Australia 2005. 5 month lap of the country in my Louis Barbour converted 1984 2CV. 16000 miles completed. 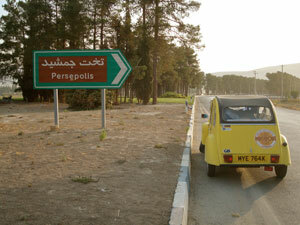 UK to Morocco 2013. 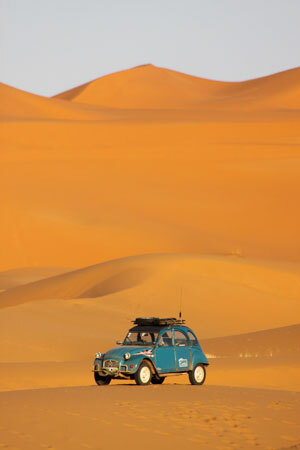 Trip to the Sahara desert in my Barbour 4x4 2CV. The 50 degree heat was quite a challenge. I am fascinated with the original Citroen raids of the early seventies and would love to retrace their steps today. Unfortunately going to Persepolis in Iran was the only one I could attempt in reality and even that was a little tricky. The other two 2CV raids were to Afghanistan and Africa. Both of which are too dangerous to attempt. However I love reading about other 2CV owners who are attempting raids of their own so please get in touch with your accounts and blogs and I will be very happy to include the links here. Photos (clockwise from top) Russia - en route to Mongolia. Persepolis - approaching the ruins. Sahara desert - posing in the dunes. Australia - Western Australia posing by the side of the road.